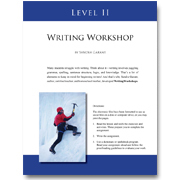 In Writing Workshop, Level II (ages 9-12), lessons focus on dialogue, creative and descriptive writing, point of view, cause and effect, and story plots. Children will enjoy the reading resources and games that provide a warm-up to the writing assignment. Self-evaluation questions guide parents and children toward the essential elements of each assignment. Usage permissions: unlimited family use. Ideal for one semester. 6 lessons, 29 pgs. Includes review assignments. 808 KB. Recommended core E-book in CHC Lesson Plans for Sixth Grade. Tour this title within the Sixth Grade Interactive Guide!